Due to circumstances beyond our control “Gravity Ghost: A Spooky Design Talk” will now be happening MARCH 25th 2015! Sorry about that! Unfortunately we will not have any AV equipment available, so instead of the presentation we will be meeting at Endgame for drinks, food, and games! We will still be meeting up at Endgame at 7:00pm on Feb 25th, but there will not be any presentation, or AV equipment to use. We hope you can understand, and still join us for a more informal hang out with Phoenix game developers! It’s time for another monthly Phoenix game developer meet up! Join us at 7:00pm on February 25th, 2015 at Endgame in Tempe! Local indie game developer Erin Robinson shares the experience of designing her game Gravity Ghost. She provides an overview of the decisions necessary for turning a simple physics toy into a complete commercial game. Three design tenets were used: 1) Always abandon ideas that don’t work, 2) Learn what to listen for when playtesting, and 3) Stay true to a theme in every aspect of the art, design, and story. 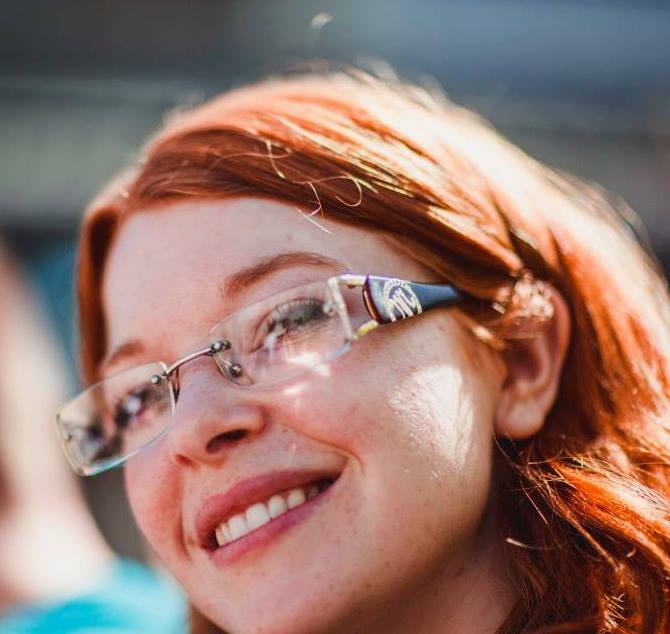 Erin Robinson has been an independent game developer for 10 years. Her games include Gravity Ghost (2015), Puzzle Bots (2010), Nanobots (2008), and Spooks (2006). She was recently named as one of Fast Company’s most influential women in tech, and she lectures, writes, and teaches about independent games all over the world. She holds a degree in Psychology from Queen’s University. The 3rd annual ZAPCON is happening April 18 and 19th at the Mesa Convention Center. For more details check out their official event page. Wiblits is a new start up founded by a local Phoenix developer which hosts quick and simple games that can be played in real time from others from around the world. Players can win real prizes like $10 gift cards, and it’s a new game each time. Check out their website! Local developer Erin Robinson and her team have launched Gravity Ghost on Steam for Mac and PC! Check it out on the Steam Store. Super Fun Games have released Crystal Catacombs on Steam for Mac, PC, and Linux. Check it out on the Steam Store. Floor 27 Industries have released their newest game Wizard Golf on the iOS app store. The 5th and Farmer lot does not require a parking permit after 6:00pm. Also The City Hall Garage is free when entering after 6:00pm.